Carson-Wilson-Rigney-Forrester-Shoemaker American Legion Post 1. Sergeant, Company D, 358th Infantry Regiment, 90th Infantry Division, United States Army. 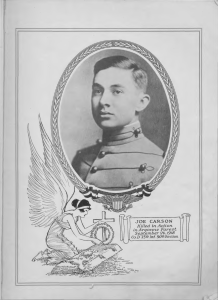 Sergeant Carson was born January 1, 1896, in Petrolia, Ontario and graduated from Central High School, in Tulsa, Oklahoma in 1915. He was killed in action on September 26, 1918, in the Argonne Forest and was posthumously awarded the Distinguished Service Cross. His body was never recovered, though his death was confirmed on the report of surviving unit members who witnessed his death on the battlefield. He is memorialized on the Tablets of the Missing at St. Mihiel American Cemetery, Thiaucourt, France; and with a marker in Rose Hill Cemetery, Tulsa, that rests with the graves of Sergeant Carson’s widow, mother, and two of his brothers. Sergeant Carson’s widow, who died in 1924, is also buried at Rose Hill with her parents. Sergeant Carson’s grave is registered at Find-a-Grave. Feel free to visit the site and leave a memorial to Sergeant Carson. 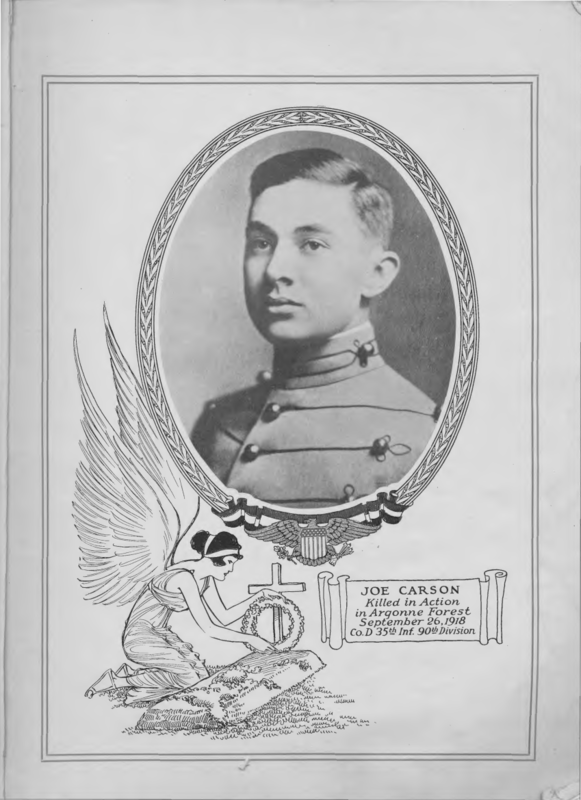 The President of the United States of America, authorized by Act of Congress, July 9, 1918, takes pride in presenting the Distinguished Service Cross (Posthumously) to Sergeant Joseph C. Carson (ASN: 2806618), United States Army, for extraordinary heroism in action while serving with Company D, 358th Infantry Regiment, 90th Division, A.E.F., near Les Huit, Chemins, France, 26 September 1918. Sergeant Carson, with two other men, volunteered to rush an enemy machine gun which had concentrated its fire on an opening in some barbed-wire entanglement through which his company was endeavoring to advance. He had successfully silenced its fire when he was killed by the fire of other enemy machine guns. Private First Class, Company I, 28th Infantry Regiment, 8th Infantry Division, United States Army. He was born September 25, 1921, in Tulsa, Oklahoma and graduated from Will Rogers High School, Tulsa, Oklahoma in 1940. He was killed in action on November 27, 1944, near Aachen, Germany, and was posthumously awarded the Silver Star Medal for gallantry in action, the Bronze Star Medal with two Oak Leaf Clusters, and the Purple Heart. Sergeant, E5, United States Army. He served in World War II from April 9, 1942 to September 25, 1945 and the Korean Conflict where he was killed in action on July 14, 1950 while serving with the 24th Infantry Division. During World War II he served in the European Theater as a member of General George S. Patton’s 3rd Army. He was awarded the Citation for Valor, the National Defense Service Medal, the European Theater Medal, the Purple Heart, the World War II Victory Medal, the Honorable Discharge Medal, the Korean Service Medal, the Bronze Star Medal with “V” device, and the United Nations Service Medal. Specialist 4, Company C, 2nd Battalion, 7th Cavalry Regiment, 1st Cavalry Division (Air Mobile), United States Army. He was born January 4, 1946. He entered Service on January 8, 1963 at Oklahoma City, Oklahoma and went to the Republic of Vietnam on August 16, 1965 where he was killed in action on November 17, 1965. Corporal, 1st Battalion, 25th Marine Regiment, 4th Marine Division, 1st Marine Expeditionary Force, United States Marine Corps. He was born on April 22, 1977 and graduated from Edison High School in Tulsa, Oklahoma in 1994. While attending Edison he lettered for three years in football and was named to the Oklahoma All State football Team. He attended Northeastern State University and graduated with a degree in Psychology and Criminal Justice. 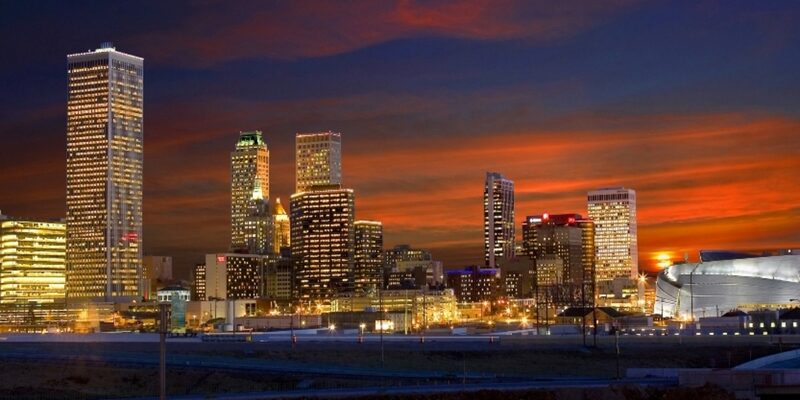 Upon graduation, he applied to the Tulsa Police Academy. His plans were put on hold when funding for the Academy was delayed. It was then in February 2003, that Jared joined the United States Marine Corps. Two years later, Jared was accepted to the Police Academy and graduated in June 2005. In December 2005, Jared’s unit was mobilized for active duty service in Iraq. While in Iraq, Jared was hit by a powerful IED on September 4, 2006. Three Marines, including Jared, were killed and one suffered severe burns. He was awarded the Global War on Terrorism Service Medal, the National Defense Service Medal, the Combat Action Ribbon, Sea Service Deployment ribbon, the Armed Forces Reserve Medal, the Purple Heart and the Iraq Campaign Medal. In addition, he received the Albert E Schwab, Marine Corps League, 2005 Marine of the Year. Then in November 2006, he was posthumously named the Albert E. Schwab Non-commissioned Officer of the Year.